SPECIAL OFFER CODES: If you have a special offer code, place the book in your shopping bag, proceed to CHECKOUT and apply the code to activate the discount. If you are ordering from Australia, Canada or the USA, the extra postage will be added into the option you choose. What does Eric Midwinter offer that is different? The thread running through his book is the manner in which the social setting influenced change in circket, and the impact of Britain’s class structure – significant because it shaped a game that took root far beyond the British Isles, in nations where class played a very different, usually minimal role. The parallels between yesterday and today are drawn with skill . . .Eric Midwinter has done a notable service in explaining just how cricket reached its present state, before it rushes headlong into a tomorrow of unpredictable change. Let us suppose someone comes to you and says ‘give me a history of cricket so that I can understand’. Where would you start? Eric Midwinter is, of course, a writer and academic, with a reach well beyond cricket, and so almost uniquely qualified to put the game in its social context. And in this case the context reaches from the dark ages to the Indian Premier League …This is very readable, but also makes you think. What more do you want? Eric Midwinter draws on some 70 years watching and almost as long reading and studying cricket to produce this fascinating account of the game in its full historical context. As a social historian, he has ever been conscious of the political, economic and cultural forces that have moulded cricket, and here, in a rich and multi-layered text, he creates an interpretation of the evolution of both English and global cricket that is refreshingly insightful and often controversial. He stylishly guides the reader from a thoughtful and sometimes amusing discussion of the theorising about the origins of the game to a shrewd analysis of the power of finance and television, with much of today’s focus on the subcontinent. To be frank, it is not holiday reading for the casual reader – but it is essential – and immensely enjoyable – reading for the genuine student and lover of cricket. In this sweeping, panoramic account of English and world cricket, Eric Midwinter analyses the turns and twists in the route by which cricket has come to be a mass entertainment, ruled by television, at the behest of high finance and with its centre of gravity to be found on the Indian subcontinent. But this is more than the narrow story of the growth of the sport itself. As in much of his other work, in sport and on other themes, Eric Midwinter provides a much broader picture, always seeking to place cricket, as leisure pursuit and big business, against a rich canvas of economic, social, political and cultural aspects. These are the forces that have moulded the game, determining how and where it should be played, who should play and watch it, and why the random youthful romps of young men and children in England and parts of Western Europe should now be an element in the world’s entertainment industry. At the same time, there are eloquent descriptions of the game and its players, with especially thoughtful and attractive profiles of W.G.Grace and Don Bradman. The author’s interpretations are insightful, refreshingly radical, sometimes quirky and occasionally very controversial. The text is multi-layered, with a luxuriance of literary and allied reference, but at all points fluent and accessible. It makes for a delightful as well as a stimulating read. 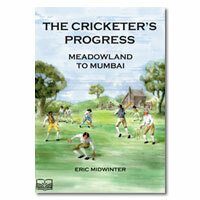 The social historian, Eric Midwinter, is the author of many books, among them several on cricket. These include (among others): W.G.Grace; His Life and Times (1981). The Lost Seasons; Cricket in Wartime 1939-45 (1987). The Bass Illustrated History of County Cricket (1992). Red Shirts and Roses; the Story of the Two Old Traffords (2005, winner of the Cricket Society/Times Cricket Book of the Year Award).